Eden Roc Miami Beach was looking to differentiate themselves from the competition in Miami and become known as the best place for LIVE music. 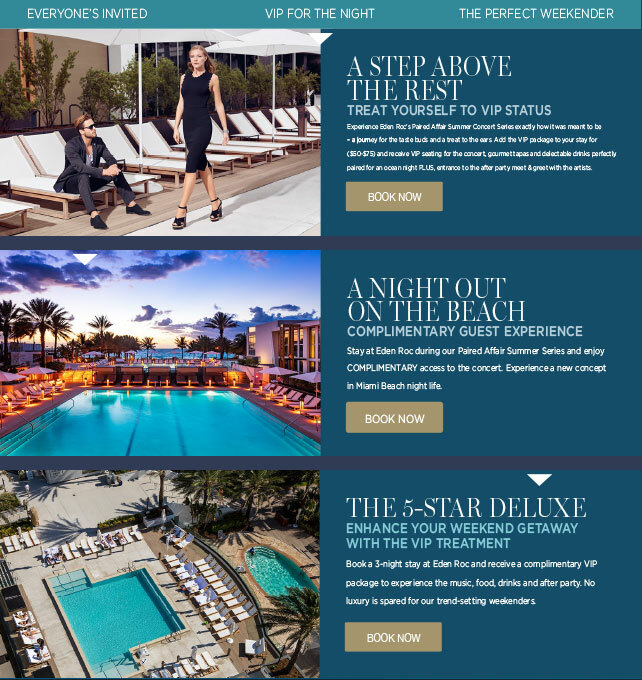 Eden Roc Miami Beach wanted to provide an elevated guest experience while increasing their food and beverage revenue as well as their bookings. Alliance Connection's Director of Talent Relations holds longstanding relationships with top talent throughout the entertainment industry who are consistently looking for great exposure and media appearance opportunities. 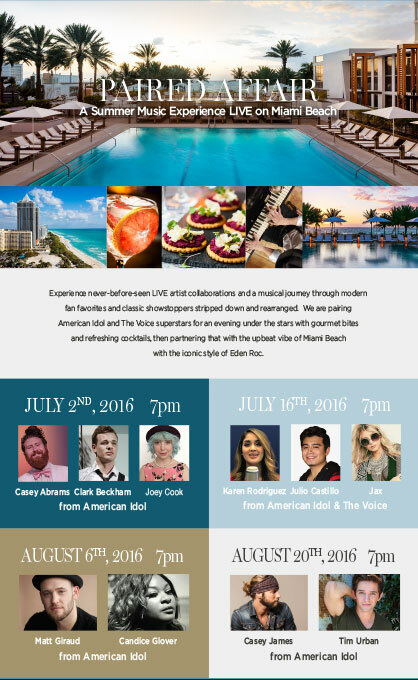 To help fulfill Eden Roc Miami's objective, we partnered them with some of the top voices from American Idol and The Voice to create unique resort programming for guests at the hotel as well as those looking for something new on the Miami Beach scene. Alliance Connection contracted the talent, designed the campaign and on-site marketing materials while Eden Roc Miami Beach provided airfare, accommodations, food & beverage and full access to their hotel for the artists. Each show was exclusively produced for Eden Roc and perfectly crafted to blend the artists' voices together into a never-before-seen show. 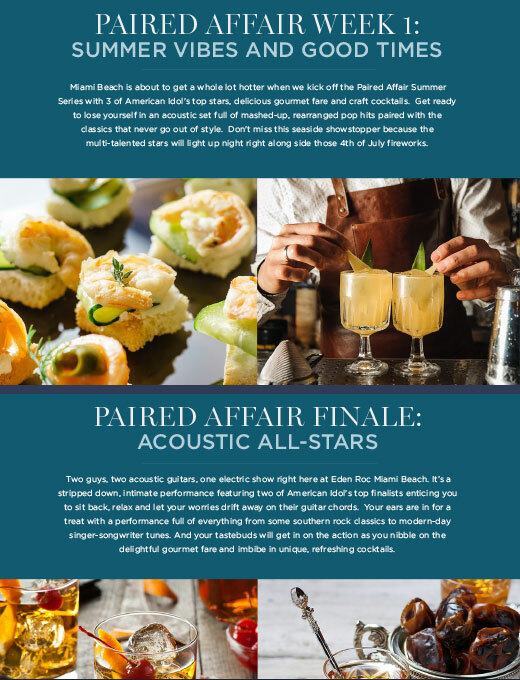 The end result prospered into a Paired Affair, an exclusive live music experience on Miami Beach complete with red carpet meet & greets and lavish food and beverage pairings. Hosted the first and third weekend of the Summer months, Eden Roc served special food & beverage packages for guests to amp up their experience in an amazing atmosphere. The weekends drew radio and PR coverage while consumers came from all along the beach strip to kick their night off right. Paired Affair was a summer music series that featured never-before- seen LIVE artist collaborations performing stripped down, rearranged versions of modern songs. Accompanied with gourmet bites and refreshing cocktails, these set lists paired the upbeat vibe of Miami Beach with the luxurious ambience of Eden Roc.